Last November hundreds of thousands of us, mobilized by the Nobody is Above the Law (NIATL) network (begun by MoveOn and now made up of a coalition of many other groups), hit the streets to stand up for the rule of law and protect the independence of Special Counsel Robert Mueller’s Trump-Russia investigation. Attorney General William Barr is now overseeing the investigation. Barr was cagey during his confirmation hearing, indicating he might not make the entire report public, and saying he’d “provide as much transparency as I can consistent with the law.” There have previously been incorrect reports that the investigation was wrapping up, and apparently the articles coming out on February 20 (a mere week after Barr’s appointment) are true, that he was preparing to announce the completion of the investigation as soon as the following week, and that he plans to submit a summary of Mueller’s report to Congress soon after, are also incorrect. One analyst had predicted this, writing that it likely would not have been THE confidential report dictated by the Special Counsel regulations, but rather a partial report. Regardless of the timing, we should take steps NOW to make sure the report is released to the public. Senators Blumenthal and Grassley have introduced S. 236, the Special Counsel Transparency Act of 2019, a bipartisan bill that would require the Mueller investigation findings to be made fully available to Congress AND the public. Neither Senators Feinstein nor Harris have cosponsored. Let your Members of Congress know that the investigation must be protected, and that whenever it’s ready, the entire report should be released to the public. My name is ______________, my zip code is ______, and I’m a member of Indivisible East Bay. Please do all you can in Congress to hold Trump accountable and protect the Mueller investigation. Only Mueller should decide when his investigation is complete. And when he’s done, the public should see his full report. Please support and cosponsor the Special Counsel Transparency Act. My name is ______________, my zip code is ______, and I’m a member of Indivisible East Bay. Please do all you can in Congress to hold Trump accountable and protect the Mueller investigation. Only Mueller should decide when his investigation is complete. And when he’s done, the public should see his full report. Update 2/25/19: On Tuesday Feb. 26 the House is scheduled to vote on H.J. 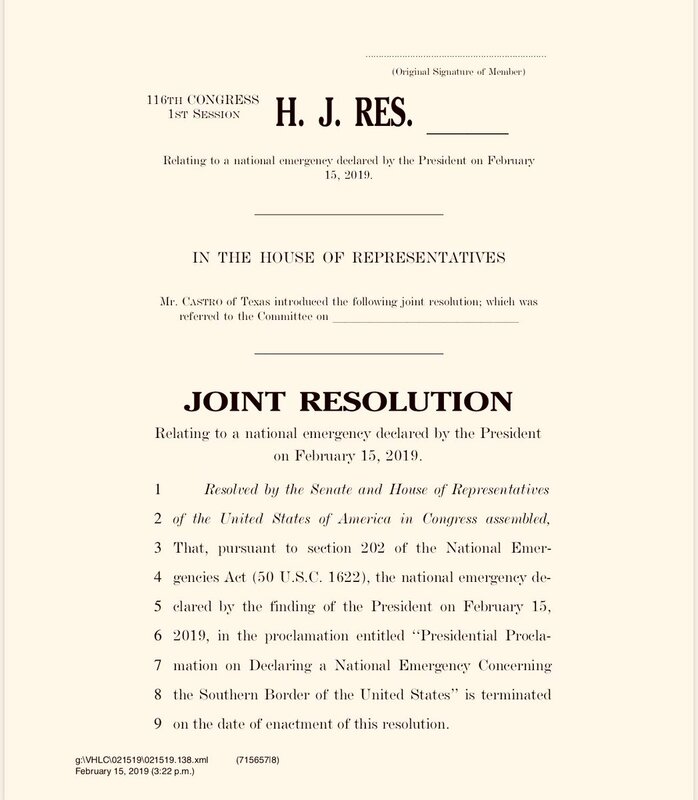 Res 46, Representative Joaquin Castro’s resolution to terminate Trump’s national emergency declaration. All of the East Bay representatives have cosponsored the Joint Resolution. Thousands of people nationwide took to the streets on He’s Not Our President Day, February 18, to protest the fake president’s fake national emergency. Indivisible East Bay members joined local protests, and IEB’s CA-11 team organized the El Cerrito action, where nearly 200 people showed up to chant and flash their great signs. See more wonderful photos taken by Mary DeShaw, a volunteer photographer with Pro Bono Photography. Hitting the streets was our first step – now we fight Trump’s unconstitutional power grab in Congress and with lawsuits brought by states and other groups. Support a joint resolution of termination to end the emergency status in the House and Senate, under the National Emergencies Act. Rep Joaquin Castro has asked all members of Congress to support his joint resolution. If a resolution passes in one chamber, the other must bring a vote within 18 days. If the resolution passes both chambers and Trump vetoes it, a two-thirds majority in Congress could override the veto. Sponsor and support the Protecting Disaster Relief Funds Act, companion bills in the Senate and House that would prohibit Trump from taking funds granted to the Department of Homeland Security, the Department of Housing and Urban Development, or the Army Corps of Engineers in recent appropriations, and using those funds to build a physical barrier on the border. Senator Harris is an original cosponsor of S 534; please thank her, and ask Senator Feinstein to sign on. As of February 19 none of our East Bay representatives has cosponsored the House bill, HR 1214; ask your Rep to sign on. My name is ____, my zip code is ____, and I’m a member of Indivisible East Bay. Trump abused his power to declare a fake emergency and Congress must do everything in its authority to stop this antidemocratic move. Thank you for cosponsoring Senate bill 534, the Protecting Disaster Relief Funds Act. Please also support a joint resolution of termination to end the emergency status under the National Emergencies Act. My name is ____, my zip code is ____, and I’m a member of Indivisible East Bay. Trump abused his power to declare a fake emergency and Congress must do everything in its authority to stop this antidemocratic move. I want Senator Feinstein to cosponsor Senate bill 534, the Protecting Disaster Relief Funds Act, and to support a joint resolution of termination to end the emergency status under the National Emergencies Act. My name is ____, my zip code is ____, and I’m a member of Indivisible East Bay. Trump abused his power to declare a fake emergency and Congress must do everything in its authority to stop this antidemocratic move. I want Representative ______ to cosponsor House bill 1214, the Protecting Disaster Relief Funds Act, and to support a joint resolution of termination to end the emergency status under the National Emergencies Act. 2. Thank California Attorney General Xavier Becerra for leading a coalition of 16 states in filing a federal lawsuit on February 18 to block Trump from diverting money that Congress designated for other purposes, in violation of constitutional separation of powers. Call AG Becerra at (800) 952-5225, or send an email. See our prior article for more info and background. We’ll update this article or post a new one as this fast-moving situation develops, so check back! Trump’s February 15 declaration of a national emergency to build his vanity wall is a flagrant attack on our democracy: an illegal, anti-democratic power grab rooted in racism. We’re coming together to defend our democracy and immigrant communities from Trump’s fake crisis and racist deportation force. We won’t let Trump get away with this. Together we’re stronger than his racist, anti-immigrant, hateful agenda. There is no emergency, and we’ve got to let every single member of Congress know they MUST FIGHT BACK! See below for what you can do right now. Then on Monday, February 18 (Not My President Day) at noon (some locations may vary start times), take your energy to the streets to join the mass mobilization organized by MoveOn – along with Indivisible, Win Without War, CREDO, and other activists and groups. Call your Members of Congress and tell them to reject Trump’s fake emergency. Congress has an obligation to check Executive Branch abuses, and there is a clear path for them to do this. They need to act to protect our democracy by passing a resolution to terminate this phony emergency and protect the people (the majority of which reject Trump’s vanity wall). Please keep checking this website – we will update this article or post new actions as we learn more! The only crisis on the US-Mexico border is the one caused by the Trump Administration’s cruel policies towards families and children seeking asylum—ripping kids from their parents, locking them in jails, changing the rules and criminalizing the legal right to seek asylum, and tear-gassing women and children. This budget deal already expanded Trump’s anti-immigrant agenda, and the National Emergency declaration only deepens the threat to immigrant communities, refugee communities, Muslim communities and our democracy. A National Emergency declaration gives Trump exceptional powers to undermine the foundations of our democracy and continue attacking marginalized communities. This is an undemocratic power grab from an unhinged man unhappy with a Democratic Congress that will not indulge his temper tantrums. The National Emergency is Trump’s second attempt to force his racist wall against the will of Congress and the American people. Workers have still not recovered from the #TrumpShutdown, which was the longest government shutdown in history at 35 days. Over a million federal workers and contractors went without pay and crucial government services like tax refunds were set back months by the closure. Congress finally stood up to his temper tantrum, and we need them to act immediately again. Trump’s fraudulent national state of emergency and unhinged government shutdown flies in the face of the will of the American people. In the 2018 election Trump and his Republican allies ran on a platform of building a wall – and lost by millions of votes. Republicans were negotiating for the budget in bad faith all along—and Congress failed by not choosing to stand up to Trump and oppose his racist agenda. The failure of Congress to stand up to Trump’s tantrum and allow him to once again threaten funding for the government and 800,000 workers paychecks hostage in an effort to fulfill his campaign promise on the wall’s funding is shameful—and created a real crisis for 800,000 working families and their communities. Donald Trump has installed a crony to oversee the Special Counsel Trump-Russia investigation, crossing a red line set to protect the investigation. By replacing Rod Rosenstein with just-named Acting Attorney General Matt Whitaker as special counsel Robert Mueller’s boss on the investigation, Trump has undercut the independence of the investigation. Whitaker has publicly outlined strategies to stifle the investigation and cannot be allowed to remain in charge of it. Acting Attorney General Matt Whitaker has a profound conflict and must be removed from overseeing the Mueller investigation. Congress must exercise its Constitutional authority to hold the President accountable and pass legislation to protect the Mueller investigation. Any future Attorney General appointed by Trump must issue a public order giving Mueller full independence to complete the investigation without political interference. If you’ve signed up for a Nobody Is Above the Law rapid response rally, follow the directions emailed to you by the hosts. Read Indivisible National’s article for more info, and call your Members of Congress to tell them to publicly call for Matt Whitaker to recuse himself. Additional red line added on Sept. 24: The Mueller investigation releases findings showing significant wrongdoing by Donald Trump. Or Congress or the administration blocks the public from seeing Mueller’s findings. We gave you the lowdown on canvassing and phone banking, the most effective Get Out The Vote (GOTV) tools. Next up, and ideal if you can’t travel to a flippable district or make phone calls: peer-to-peer text banking! Texting voters is effective, fast, and flexible. You can do it on your phone, computer, or tablet. And best of all, you can fit it into your busy schedule — during breaks at work, riding on BART, any time you’ve got a few free minutes. There are different texting platforms, but the basics are similar: sign up, read the instructions, join the platform’s Slack channel (a chat room where you interact with team managers and fellow texters), and log into the platform. Finally, follow directions to choose a workflow and request to be added. For most platforms you can text from your phone using an app, or from your computer by logging into a website. Both have initial messages you’ll send out; after that you’ll reply to people who respond, using canned answers tailored for each workflow. You’ll also apply certain tags to help the organizers know how to proceed with each person texted. Here are some great choices to dive in and start texting for The Blue Wave! IndivisiText automatically reassigns to another texter to conversations that are inactive for about 20 minutes, so along with replying to the people you texted, you’ll also help out by following up for others. Note that on RL only you can reply to responses from the people you’ve texted, so make sure to check frequently. Moveon.org’s texting team uses Spoke rather than Hustle, and also has its own Slack chat room to organize requests for workflows and support. You can learn more and join the team here. Finally, want to personalize your texting along with reaching out to strangers? The VoteWithMe app uses public records and your own network to pinpoint the highest impact potential voters whom you already know. You choose who to text, and you can personalize a suggested reminder to make sure they vote. Read more about using this very effective app to motivate your friends to vote in our article. Don’t want to wake up on November 7, 2018 and feel like you did on November 9, 2016? If you haven’t done any canvassing, phone banking or text banking yet, the time is NOW. If you have, it’s time to DO MORE! Join us and bring everyone you know to The Last Weekend GOTMFV Palooza!! Saturday & Sunday November 3-4 from 9 AM to 9 PM: full-service GOTV MACHINE – with phone banking and texting into multiple critical races, training and technical assistance, handouts, FOOD, and the best part: SAVING DEMOCRACY WITH YOUR FELLOW WARRIORS!! Canvass with Working America AFL-CIO in CA-10 (Modesto) and CA-21 (San Joaquin Valley). When last we met for a Trump-Russia investigation update, we were concerned that the August 21, 2018 convictions of Paul Manafort and Michael Cohen had shoved us closer to the precipice of a constitutional crisis. Well, a month later it feels like we’re dangling by our fingertips. Breaking news on September 24 about Rod Rosenstein’s status as deputy Attorney General included conflicting accounts on whether he was planning to resign, had been fired, or remained in his post as Robert Mueller’s boss on the investigation. The White House eventually said that Rosenstein still had a job, but would meet with the Current Occupant on Thursday, September 27. Because as of now Rosenstein has not been fired, the Nobody Is Above the Law network has NOT triggered the rapid-response plan. Indivisible National’s updated article makes an additional point that the administration is sowing chaos to distract from the ongoing fight over the Supreme Court, and until we have news that Rosenstein has been fired, we must focus on supporting the brave survivors coming forward to tell their stories and fight to keep Brett Kavanaugh from getting confirmed. MoveOn’s Mueller’s Firing Rapid Response – The Plan lists the basics, and also addresses something we’re all wondering — what happens AFTER we hit the streets? Contact your Members of Congress! See our article for a historical overview of the bills introduced to protect the investigation, none of which have progressed. Demand a vote on, and to support the Special Counsel Independence and Integrity Act (S. 2644) to protect Mueller and the Russia investigation. Protect the special counsel’s office, including preserving its files and staff and ensuring it receives the full cooperation of all federal government law enforcement assets. Manafort. Cohen. Trump? Guilty, Guilty, Guilty! OMG! We witnessed on Tuesday August 21, in little more than an hour, a confluence of events that a political thriller screenwriter would reject as too far-fetched. But the head-spinning news was true, and, if you’re Paul Manafort, Michael Cohen or Donald Trump, the truth was astonishingly bad. At almost exactly the same moment, in two courthouses only a few hours drive from each other, two of Trump’s key associates were found guilty on multiple counts for federal crimes. In Virginia, at the trial of Trump’s former campaign chairman Paul Manafort, a jury found the defendant guilty on eight counts of tax fraud and bank fraud. Since this was the first jury conviction in Special Counsel Robert Mueller’s investigation, you might think this would be the worst news of the day for Trump and his base and enablers. At the same time as the Manafort jury delivered the guilty verdicts, Trump’s long-time personal lawyer and “fixer” Michael Cohen stood in a federal courtroom in New York City and pled guilty to five counts of tax evasion, one count of bank fraud, and, most critically for potential impact on Trump, a count of having violated campaign finance laws “in coordination with and at the direction of a candidate for federal office.” Trump isn’t named, but Cohen’s court filing refers to “Individual-1, who by January 2017 had become president of the United States.” The violation refers to payments Cohen made to Stormy Daniels and Karen McDougal to prevent them from going public with their salacious stories in the weeks before the 2016 election. While no one expects Trump to admit it, the day’s events put the lie to any notion that the Mueller investigation is a “rigged witch hunt” or “hoax.” Quite the contrary. We can’t overstate the shattering implications of what went down on Aug. 21. For starters, Cohen stated under oath in open court that “Individual-1” (evidently He Whose Name May Not Be Spoken, but who we all know is Donald J. Trump) conspired with him to commit a federal crime. Cohen further said that the charge linked to McDougal was done “for the principal purpose of influencing the election.” In normal times, this alone would be sufficient to initiate impeachment proceedings. Sadly, these are not normal times. Rather, these are times when a gutless GOP-controlled Congress won’t even think the “I” word for fear of Trump and his base turning on them. Meanwhile, 69-year old Manafort faces a sentence that legal experts estimate from seven to 10 years, and a second trial on separate Russia-related charges due to start next month. The pressure for him to cut a deal for leniency in exchange for info about Trump appears immense. Trump’s pardon of a key witness would be a serious, crisis-precipitating obstruction of justice; an attempt to impede the investigation into crimes his co-conspirator has plead guilty to, crimes that may have altered the outcome of the election and thus call into question the legitimacy of his victory. See MoveOn’s Mueller’s Firing Rapid Response – The Plan. It includes the general plan, and also addresses something that we’re all wondering — what happens AFTER we hit the streets? Read this NBC News article for a great rundown of emergency planning Democrats are taking to prep for the “break glass” moment if Trump tries to shut down the Russia investigation. Ted Landau contributed to this article. Ted is a retired professor of psychology. He has also spent several decades as a tech journalist/author — writing primarily about Apple products. He has been politically active in the East Bay since moving here in 2004.